Hold Onto Your Rainbows...a Stormy Prototype Has Been Found!! Mattel's line of Rainbow Brite dolls in the 1980s was massively successful. It's hard to find a female 80s child that didn't have at least one character from Rainbow Land in her toybox. Launched in 1984, the line of toys ran for three years. Towards the end of the line, in 1986, they created some "Dress-Up" dolls that were similar to their earlier counterparts, but came with removable clothing and accessories. Dress-Up Fashion versions of Rainbow Brite, Moonglow, Tickled Pink, and Stormy were prototyped, photographed, and advertised. Rainbow Brite and Tickled Pink were made available in several countries. Moonglow was exclusively sold in Germany, but Stormy was never actually produced. This has been a sore spot in the Rainbow Brite fan community for decades. 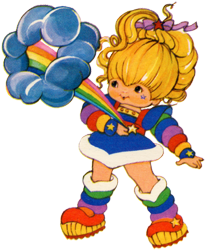 Stormy was given more screen time and lines than Tickled Pink in the Rainbow Brite television show and movie, so why was Tickled Pink produced but not Stormy? Though she had a bit of an attitude, Stormy was relatable and fun. When Rainbow and friends ran into hard times, Stormy was always willing to help - even if her help came with a small dose of snark. Tickled Pink, on the other hand, had no unique personality to speak of. We barely knew her or what her purpose in Rainbow Land was. One can only assume she was produced because "girls like pink." Perhaps the plan was to produce Stormy last, but the line had lost its steam by that time. Whatever the reason, we've been angry about it for a very long time, and have begged multiple toy companies to produce her in subsequent reboot lines to no avail. If that weren't bad enough, the Stormy prototype(s) that were created and photographed have eluded fans as well. Galacticatt, the Rainbow Brite fandom's expert on prototype dolls, has acquired several over the years, but even she has not been able to track down Stormy. We don't even know who the doll's designer was! It was assumed all hope was lost and proto-Stormy would never see the light of day...until now! An 80s toy collector recently contacted me with a very interesting story. She'd been collecting vintage toys since the 80s (before they were considered vintage! ), but only began giving focus to Rainbow Brite dolls in the last two years. As she began her research, she found information about rare dolls like Moonglow and Stormy, and recalled a purchase she'd made back in 1999. At an estate sale in or near Los Angeles, she had purchased a Dress-Up Rainbow Brite, and what she now recognizes as a Stormy doll! The room where she found the dolls was full of toys - Rainbow Brite, Barbie, Strawberry Shortcake and more. She would have purchased them all if she could. Apart from the two she bought, she recalled there being another Dress-Up Rainbow Brite, two Tickled Pinks and three Moonglows. Knowing very little about Rainbow Brite and not having access to the internet at the time, she only bought the two she did because she thought they were pretty! Die-hard fans will also know how incredible it is for someone to have had three Moonglow dolls in the United States in 1999! Perhaps some of those were prototypes too. We may never know. But what I find most interesting and heartbreaking about this story is why the estate sale was taking place at all. The collector spoke with the owner of the house, and it turns out that the toys belonged to her son, who had recently died from AIDS. He had worked in the toy industry and loved collecting dolls. She was moving because she couldn't bear the memories that lived on with her in that house. We don't know his name. We don't know who he worked for. We don't know how he came to own these dolls. All I do know is that I would have loved this man of kindred spirit and wish I could tell him so. Stormy's owner sent several pictures of the doll to myself and Galacticatt, and we agree that the doll is legit. The doll's clothes are hiding in a box somewhere in the owner's house, so we don't have pictures of the outfit yet, but she will find and photograph it as soon as possible. So without further ado...pictures!! *Because we don't have the full history of this doll, I can't say with 100% certainty that she is a prototype; but with everything Galacticatt and I know about Rainbow Brite prototypes, we are 99.99999% sure that she is. If I ever discover that we were wrong, I will update this post. Wow, this is incredible! I had totally forgotten about these and it's just so cool how the mystery has been solved. What a treasure this woman has. :) Thanks for sharing! By now, I'm sure you know, Hallmark is releasing Stormy for Christmas 2016!